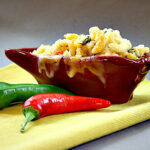 Hatch Green Chile Macaroni and Cheese. Take this luscious Macaroni and Cheese recipe and add roasted green chiles, tomatoes and chili powder and you’ve got a great Southwestern side dish. Deliciously gooey, pleasantly inexpensive, this warm blanket of comfort food gives us every reason to have a lifetime love affair with Macaroni and Cheese. From the low brow out-of-the-box version, to clever and fancy combinations in expensive restaurants, to homemade, I love it all. I suppose there are a handful of people somewhere, someplace who don’t like it, but I can’t imagine the reason why. I feel like I should introduce my two stunt peppers. They’ve appeared in two posts now. These red and green chiles are from my garden and not Hatch Chiles at all. Last Spring, I bought a pepper plant at our Farmer’s Market simply labeled as New Mexico Chile Pepper. They’ve done well in my garden and these two prolific plants have yielded many peppers and produce both red and green on the same plant. And, they are H-O-T. Using my go-to recipe for macaroni and cheese, I simply added a healthy portion of chopped roasted Hatch green chiles, chopped tomatoes and a dab of Chamayo Chili Powder. I also added some fine chopped cilantro to the crunchy Panko topping. I switched out the cheese to Tillamook Colby Jack. The end result of a bit of heat and Southwestern smoky flare from the Hatch Chiles. We savored every bite. 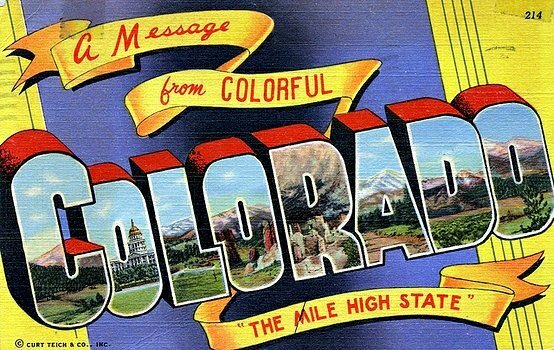 Please tell me you’ll give Hatch Green Chili Macaroni and Cheese a try. And if Hatch Chiles are not available in your area, any roasted green chile would work for this recipe. I’d recommend Poblano. 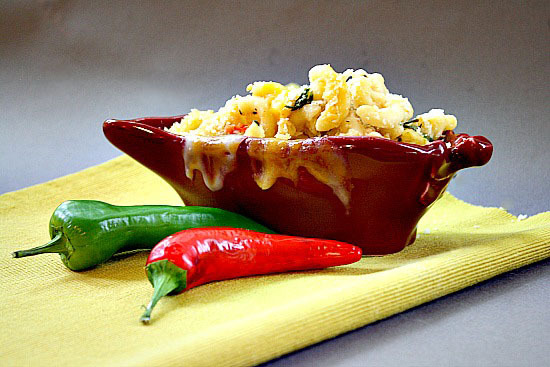 Our Hatch Green Chile Macaroni and Cheese recipe is creamy Mac and Cheese with roasted green chiles, tomatoes and Southwestern spices. Pure comfort food! 12 roasted Hatch chiles tops chopped, some charred skin removed with hand. Don' rinse chiles under water. Heat the oven to 350 degrees. Toss the panko bread crumbs with the 1 teaspoon of melted butter on a small baking pan. Toast the bread crumbs until lightly browned, about 7-10 minutes. Set aside to cool. Once cooled, add chopped cilantro. In a large saucepan, heat the butter over medium heat until melted, then stir in the flour. Stir until the mixture is blended and smooth, about 1-2 minutes. Remove from the heat and slowly whisk in the milk. Add the dry mustard, white and Chamayo pepper, and salt. Return to heat and stir until mixture begins to boil, then reduce the heat to low and simmer for 30 minutes, stirring occasionally. Stir in the chopped Hatch chiles and tomatoes. Stir in 5 cups of the cheese until melted. Pour the sauce over the cooked macaroni in a large bowl, stirring until all of the macaroni is coated. If the mixture seems dry or you're not hearing that "perfect pasta sound" add a little of the pasta water for consistency. Pour the macaroni into a well-buttered 9- by 13-inch casserole. Drizzle heavy cream around the edges of the casserole. Sprinkle on it the remaining cheese, then the toasted bread crumbs. Cover the casserole with aluminum foil. Bake 20 minutes. Remove the foil and bake uncovered an additional 10 minutes. Put under a preheated broiler for 5 minutes. I love that chile dish! This sounds absolutely wonderful but I guess I’ll use poblanos and I don’t have any stunt peppers, lol. This is a tempting dish! I am always on the lookout for cheesy chile deliciousness! And those photos are gorgeous . . . standing O for the stunt peppers! man o man that looks like my perfect mac and cheese…. This is a mac and cheese that I must make soon! 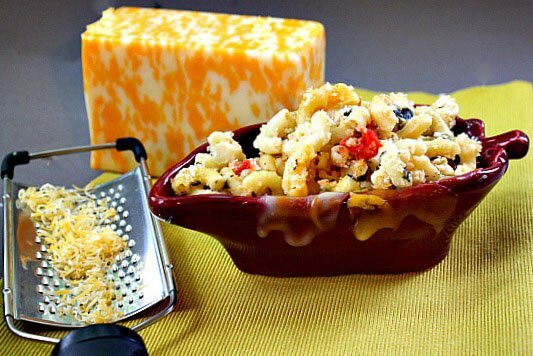 Thanks for sharing such a great twist on mac and cheese! Now why haven’t I thought of that – brilliant to use the roasted chiles in M&C. Love the presentation with the cheese running down the side. If I had a dollar for every time I said that about a recipe…..
Looks good! I planted some Anaheim peppers in our garden this year and they are so much more flavorful than the ones you get in the store. Well, not that I was surprised, but, dang, they’re good! I love all peppers Karen. I planted poblanos this year and haven’t picked them yet. We couldn’t quit eating it Ansh. It was an indulgence. 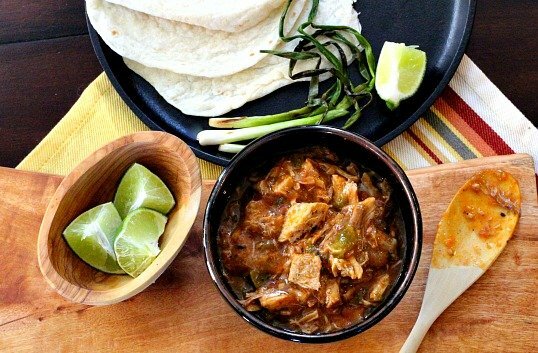 I think I would go for just a touch milder chile, but overall this recipe looks amazing! And the chiles just POP in the photo 🙂 Visiting from Marvelous Mondays! Thanks so much Nicole for stopping by. A milder chile would be great in this… as would no chile at all. You just can’t beat mac and cheese. This looks like a great comfort food! Thanks for linking up to MM this week! Seriously, I love mac & cheese! It’s my go to lunch and I actually just made some today to last me the rest of the week. I’m definitely going to try this amazing recipe next week though! Pinning! Love addition of the chilis to the mac ‘n cheese. now I only need someone in my family who would eat it with me! You can invite me and we’ll arm wrestle for the leftovers. 🙂 Thanks for stopping by Peter.